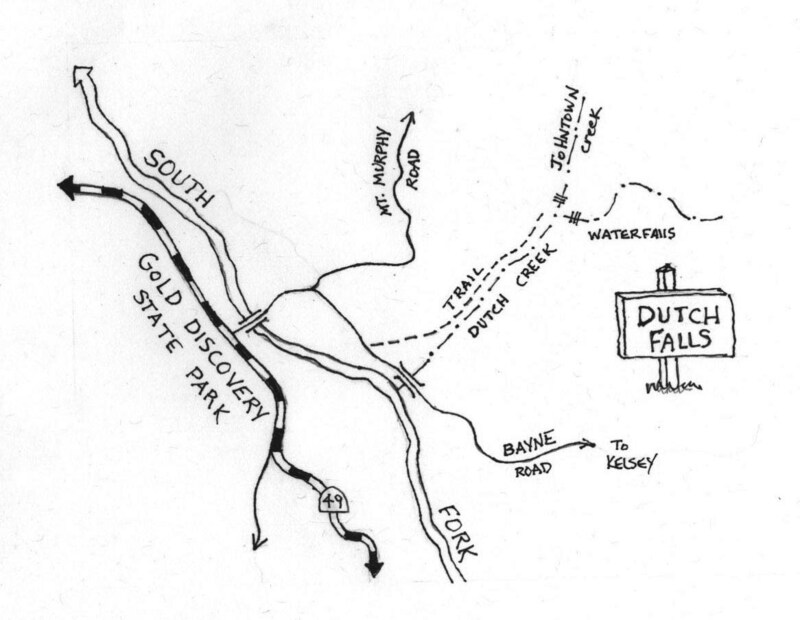 Awesome waterfalls celebrate the marriage of Dutch Creek and Johntown Creek. 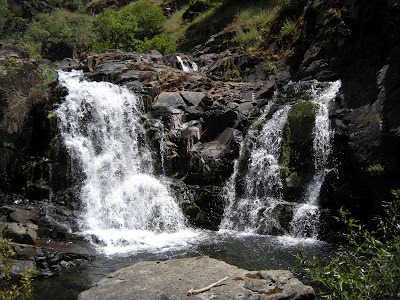 The American River Conservancy recently acquired this land, so these twin 30’ falls are now accessible to the public. These are some of the best waterfalls around, not too hard to find. Directions: Drive to the Gold Discovery Park in Coloma on Hwy 49. There is no parking near the trailhead, so you need to park in one of the Gold Discovery Park parking lots. Pay the $5 per car parking fee at the Park HQ bldg and place the receipt in your car windshield. Walk across the one lane South Fork American River bridge. Pass the campground and take the first right turn onto Bayne Road. The trailhead is directly across from the dark brown house at 6060 Bayne Rd. There is a large white sign at the trailhead that says, “Mt Murphy Phase II Acquisition”. Climb over the padlocked green double gate in front of the large white sign. This trail is No Longer maintained and is hike at your own risk. It is over grown and lots of poison oak, Be aware of rattlers as well.